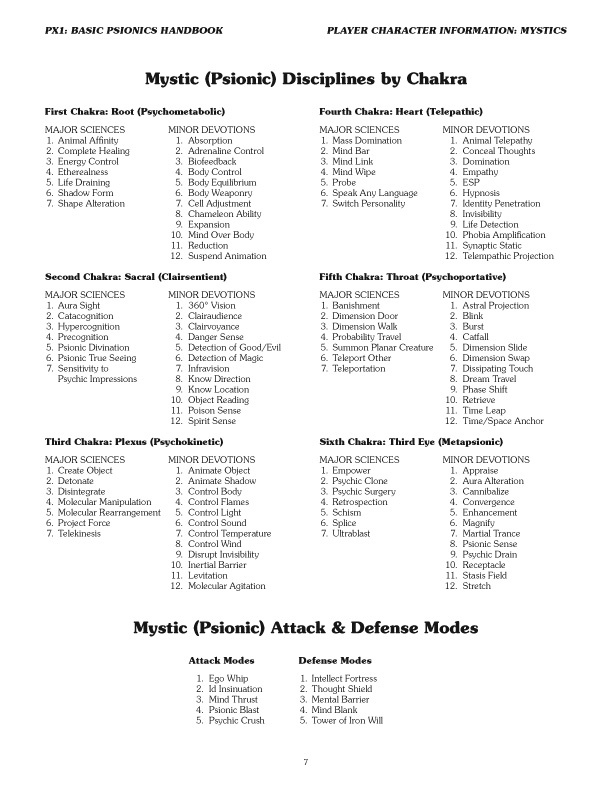 Because someone expressed an interest in which disciplines were actually included in the Basic Psionics Handbook, I thought I'd go ahead and share these two pages from the book: the list of disciplines by chakra/discipline group, and the alphabetical list of disciplines. When Welbo and I were discussing which abilities to include in the Basic Psionics Handbook, we had a couple of goals in mind: 1) we wanted to keep the list of disciplines as much like the original (OD&D/AD&D) lists as possible, and 2) we wanted to keep the disciplines balanced by Chakra (in case people used relational or wild attainment, we wanted each group to have the same number of available abilities, so any single category didn't feel like it might be slighting the character that chose it). That being said, one of the things I'm currently working on is working through the psionic abilities in the SRD and working to convert some of them for use with the Basic Psionics Handbook. Today, I present a few of them here for you. I plan on a couple of more posts like this, but am not sure how many (so we'll just call today's post "Part 1"). This ability creates an affinity feedback loop between the psionicist and all creatures (friendly or hostile) within the area of effect. While the duration lasts, affected creatures take all damage (including ability damage) and heal all wounds as the psionicist does. Hit points gained or lost persist after this duration ends. Creatures in range are also subject to magical and psionic effects of 3rd level or lower. Creatures that have an affinity with the psionicist gain a saving throw against each harmful effect transferred through the affinity field as if the power were manifested upon them normally. All magical and psionic effects transferred to subjects fade at the end of this power’s duration, although instantaneous effects remain. If the psionicist suddenly becomes immune to a particular effect or power, that immunity cannot be transferred to creatures that have affinity with the psionicist. This duration of this ability begins on the round following its initiation. With the use of this ability, the psionicist is able to move up to the his or her full movement for the round and use a psionic ability requiring concentration. The duration of the ability is 1 round per 3 psionic levels plus 1 round, beginning on the round after this discipline is initiated. Allows the psionicist to know where he or she is in relation to a fixed starting point, which is essential for setting up a mishap-free teleport beacon. While the duration lasts, the user is aware of his or her exact distance and route (physical or psychoportive) back to a fixed starting point. The “anchored” starting point is the exact location when the power was initiated. To designate other anchored starting points, the psionicist must manifest this power multiple times and be present at the desired locations when this is done. This ability allows users the ability to retrace their steps through a maze automatically while the power lasts, without resorting to a map. The use of anchored navigation is confined to the plane of existence where it was initially manifested. As the psychokinetic minor devotion concealing amorpha, but the ability grants the user total concealment. Attackers cannot target the psionicist directly (in combat or with targeted spellcasting); they may only attack into the general area where they believe the user to be located, with a 50% chance of failure, even on a successful “to hit” roll. This same chance to “miss” also applies to targeted spellcasting, but not area effects. Using concealing amorpha, the psionicist weaves a quasi-real membrane around themself. The psionicist remains visible within the translucent, amorphous enclosure. The distortion provided by the rippling membrane encasing the psionicist’s form grants the user with concealment. In combat, opponents have a 20% chance of missing the user, even on a successful “to hit” roll. This same chance to “miss” also applies to targeted spellcasting, but not area effects. When covered by the membrane, the psionicist can pick up or drop objects, easily reaching through the film. Anything held by the psionicist is enveloped by the amorpha. Likewise, the user can engage in melee, make ranged attacks, and manifest powers without hindrance. Allows the psionicist to link his or her mind with another psionic creature’s mind, creating a brief conduit through which mental energy (PSPs) can be shared. With a single use of this ability, the psionicist may transfer from his or her reservoir to the recipient a number of PSPs, not to exceed the user’s psionic level. Furthermore, the recipient's PSP reservoir may not exceed his or her normal maxiumum. Due to the intimate nature of this power, it cannot be fabricated into a psionic item. This ability allows the psionicist to call a weapon “from thin air” into his or her waiting hand. The weapon is, in fact, a real weapon hailed from another location in space and time. The psionicist need not see or know of a weapon to call it as it doesn’t call a specific weapon; the psionicist specifies only the kind of weapon. The weapon is made of ordinary materials as appropriate for its kind, but is distinctive due to its astral glimmer. A called weapon is treated as a +1 magic weapon in regard to “to hit” rolls, but does not provide any damage bonuses. If a projectile weapon is called, it comes with 3d6 nonmagical bolts, arrows, or sling bullets, as appropriate. The weapon is usable only by the psionicist that called it, and may only be of a type usable by that psionicist (e.g., a mystic may call only a dagger, but a dromite may call any type of weapon usable by that character class). If a grip on the weapon is reliquinquished for 2 or more consecutive rounds, it automatically returns to wherever it originated. If handed to another character, the weapon return immediately. A melee weapon will remain for a duration of 1 turn. A projectile weapon will remain until the last projectile is fired or for a duration of 1 turn (whichever comes first).. 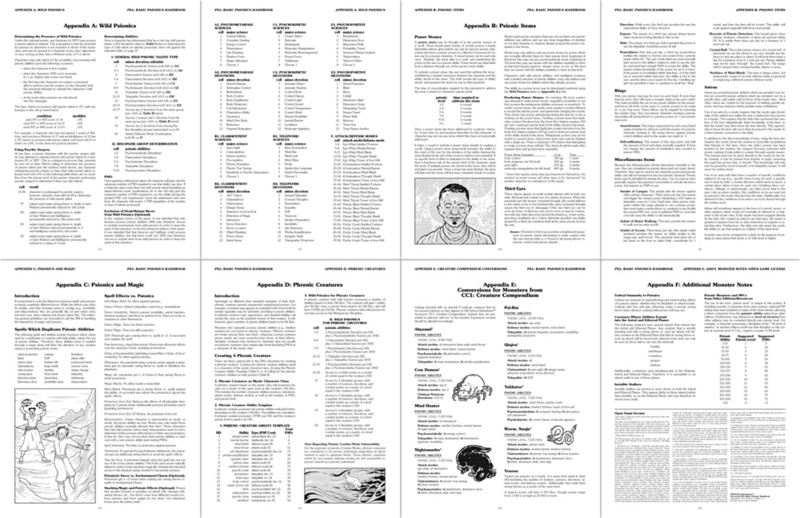 Here's another psionic character class for you, this time downloadable as a PDF. Dromites already appear in the monster section of the Basic Psionics Handbook, but they seem a natural fit for a BX character class (and are already a playable race in newer game editions). 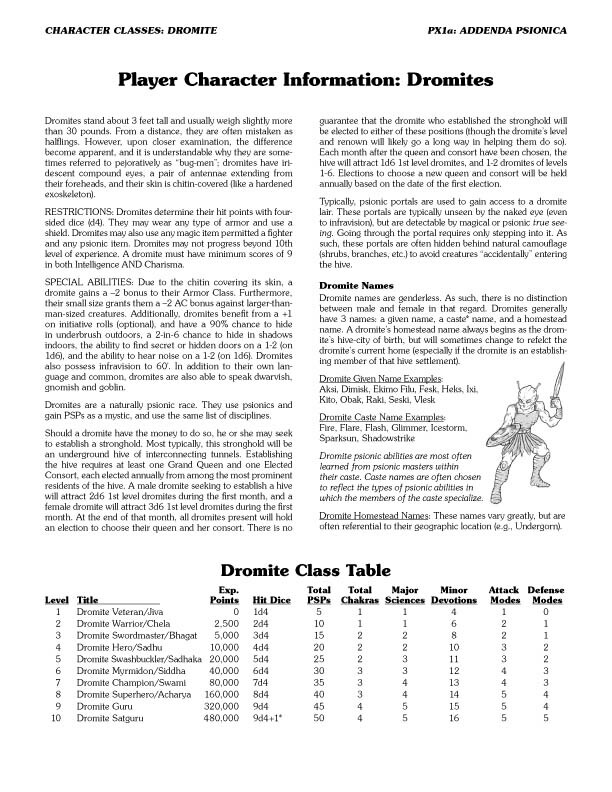 Click here to download the Dromite character class PDF. 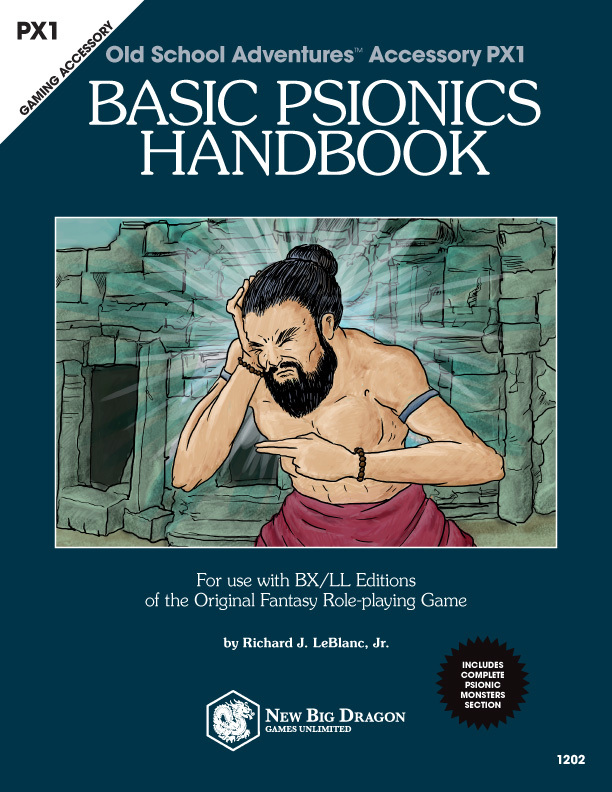 Click here to buy the Basic Psionics Handbook at a special introductory price. (The price will go up when the print copies are released for sale in a little over a week). 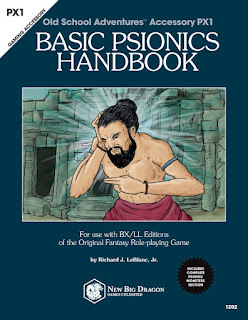 By now, most of you know the Basic Psionics Handbook is available in PDF. I'm waiting on my print proof copies from Lulu.com, and pricing from my local printer for direct sales costs, but should have the print copies available within the next couple of weeks. Once the print copies are available, the PDF version will go it's normal price of $7.95, but you can still get it now for $5.99. The 2014 Three Castles Award winning Valley of the Five Fires is on sale for $3 (marked down from it's normal price of $5.95). When the price of the Basic Psionics Handbook goes back to normal, so will Valley of the Five Fires. I personally think mongolian-inspired setting would make a nice backdrop for a psionics campaign using mystics and monks. The Dragon Horde zines are now completely free (issue #1 used to be PWYW, and issue #2 was sold for $3). These are their new permanent "prices." 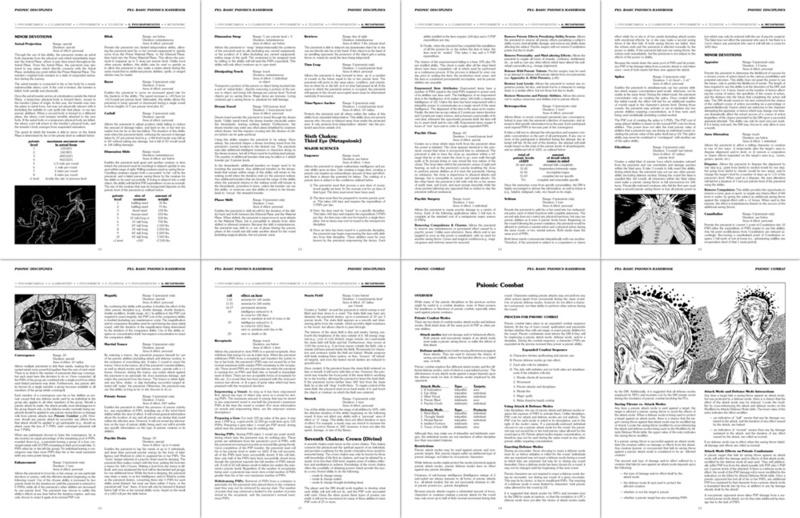 And if I ever get around to doing some additional issues, future zine issues in PDF will always be free. I had forgotten I'd made this for Eric Potter during the playtesting for the Basic Psionics Handbook. 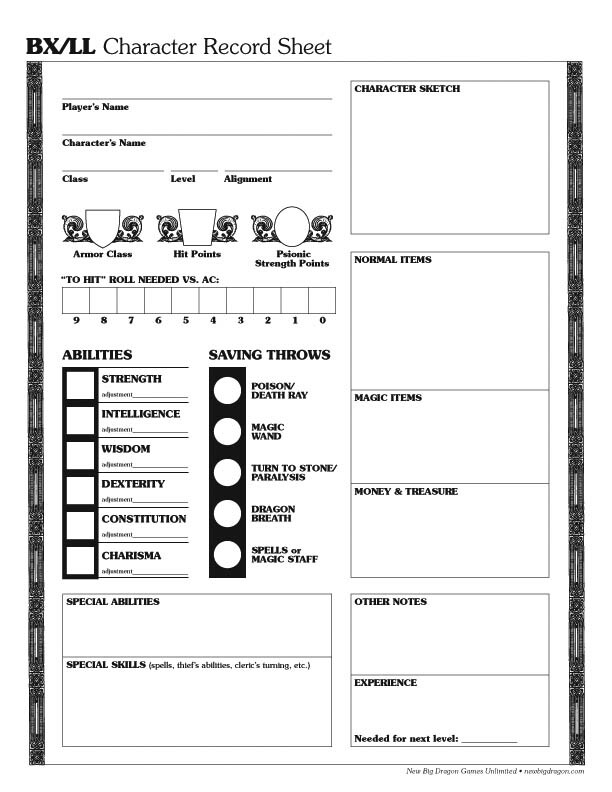 It's a BXL/LL character record sheet with a space to record PSPs, for use with the mystic class, monk class, or characters possessing wild psionics. Click here to download the PDF from Media Fire. 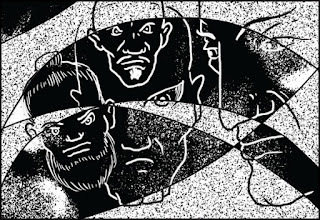 As I've mentioned previously, the two main sources that fed the input for what Tim Kask developed as psionics in Eldritch Wizardry was a mystic class penned by Steve Marsh (which provided the source for the psionic disciplines) and a devine class created by Gary Gygax (which provided the source for psionic combat). 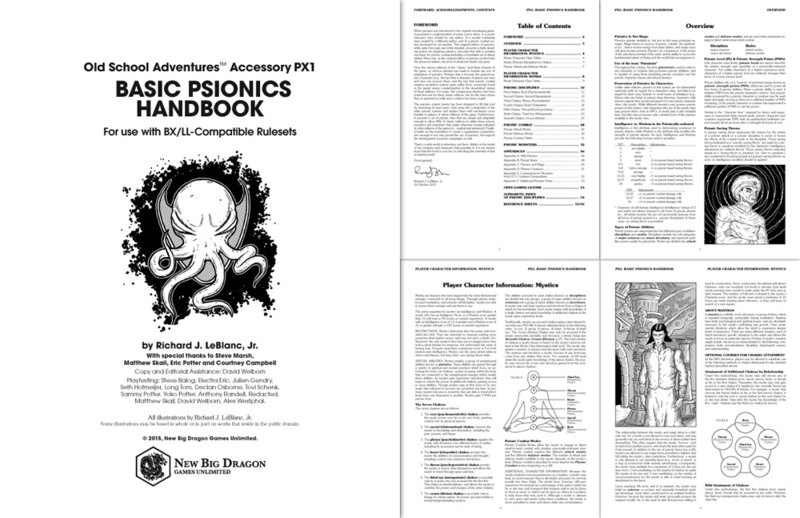 The mystic class for the Basic Psionics Handbook was developed by me under the guidance of Mr. Marsh (and, again, I thank him profusely for his input and advice). Unfortunately, I don't have the same luxury of being able to ask Mr. Gygax for his input on a devine class. I do, however, have as reference a version of the devine class penned by Mr. Marsh under the class title of "Psychics" which I believe was either published in, or intended to be published in, an issue of The Cupric Text zine (I'll need to get clarification from him on this). His psychic class employs combat modes, and it was Mr. Marsh's "rock/paper/scissors" idea that fed the basis of the way psionic combat works in the Basic Psionics Handbook. What you'll find below is my take on the devine character class for use with the Basic Psionics Handbook, inspired by the demon slayers of hindu legend. (Take a moment and go get your 1e Monster Manuals; you'll find that all greater demons possess psionics.) 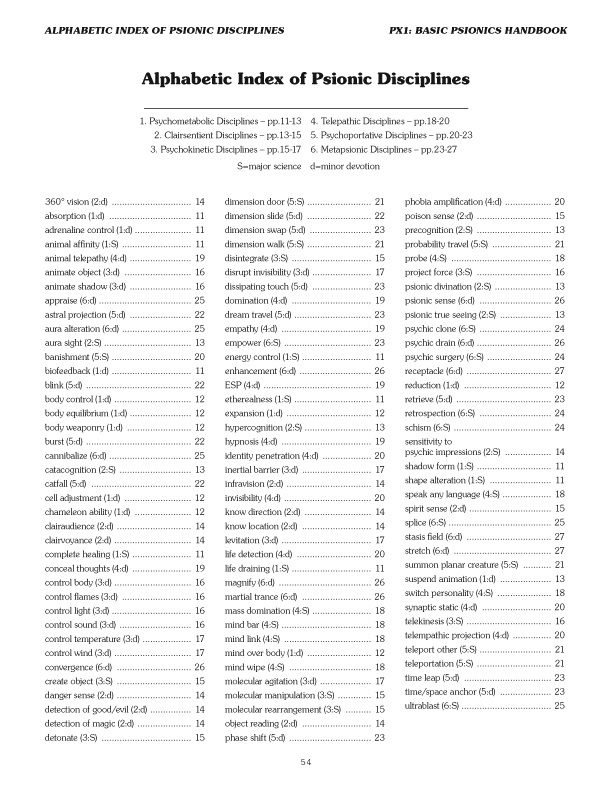 This class will for sure appear in the Character Class Codex, but will likely appear sooner in an addenda volume for the Basic Psionics Handbook (tentatively titled Addenda Psionica) which will include some additional psionic classes, powers, monsters and items I've been working on. The devine is a mystical combatant who balances physical prowess (with traditional weapons) and psionic prowess (through the use of psionic combat modes). 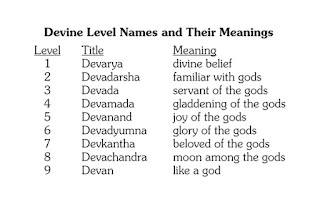 Although the powers of a devine are derived from innate psionic talent, devines are akin to clerics in that they receive assistance from divine patrons known as devas (benevolent divinities) and asuras (malevolent divinities). Devines often find themselves in the roll of demon slayer, in service to a deity (or deities). The prime requisites of a devine are Strength and Wisdom. If a devine has a score of 13 or greater in both Strength and Wisdom, the character will gain a +5% bonus on earned experience points. If a devine has a Strength of 13 or greater AND a Wisdom of 16 or greater, the character will gain a +10% bonus on earned experience. Devines use the same attack and saving tables as clerics. RESTRICTIONS: Devines determine their hit points with six-sided dice (d6). Devines may wield any type of weapon, wear any type of armor, and use a shield. They are permitted the magic items normally permitted a fighter, and the psionic items normally permitted a mystic. A devine must have a minimum score of 9 in both Intelligence and Charisma. When a devine reaches name (9th) level, he or she may choose to build a fortress, which must contain a shrine. The cost of the construction is 125% of the normal cost for a similar fortress, as the devine will spare no expense in furnishing the building and decorating it in such as a way as to honor the divinity(s) to which the devine pledges his or her honor. Once constructed, the fortress will attract 2d6 1st level fighters who will serve the devine as a personal guard. There is a 50% chance that one of those fighters will, instead, be a 1st level devine. SPECIAL ABILITIES: Through a combination of meditation and devotion to the gods, devines are endowed with a number of special abilities. The greatest of these is their knowledge of psionic attack and defense modes, which devines gain as they rise in level. 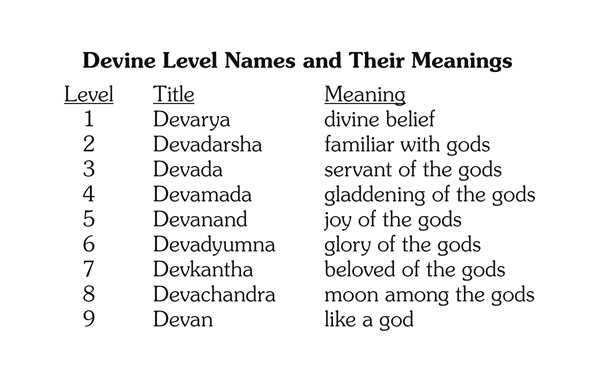 Because the devine dedicates himself to both the physical and the divine, devines earn PSPs at a much more restricted rate than mystics, but at a much greater rate than monks, gaining 4 PSPs per psionic level. Devines are subject to the same “character time” requirements as other psionicists for the daily regeneration of PSPs—an undisturbed period of meditation and prayer (usually about an hour) after a full-night (8 hours) of rest. All of these abilities are usable concurrently if the devine so chooses. Devines are unable to detect the presence of natives of the Shadow or Dream Planes. While manifested, these extra limbs provide the opportunity to wear/use additional magic items (e.g., bracers, gloves, rings, etc. ), increase the amount of weight a character may carry/lift/drag by 25%, and provide a +3 bonus to any Strength check or grappling attempt. Banishment. Beginning at 10th level, a devine gains knowledge of the psychoportative discipline banishment. The devine may use this ability at will, but with the same PSP cost as a mystic (3 PSPs per use). Concurrent Use of 2 Attack Modes. Beginning at 11th level, a devine may use 2 attack modes concurrently. The PSP cost for each is the same as normal. Victims must make separate psionic saving throws for each or suffer the effects of each attack as normally prescribed. Concurrent Use of 2 Defense Modes. Beginning at 13th level, a devine may use 2 defense modes concurrently. The PSP cost for each is the same as normal. The benefits provided by the concurrent modes do not stack; instead, the more beneficial option of the 2 modes employed is used for the sake of determining saving throws, and the more beneficial option of the 2 modes employed is used for the sake of determining effects on a failed saving throw. I still have to do a final proofread, and finish the back cover illustration, but all the interior illustrations are in place. 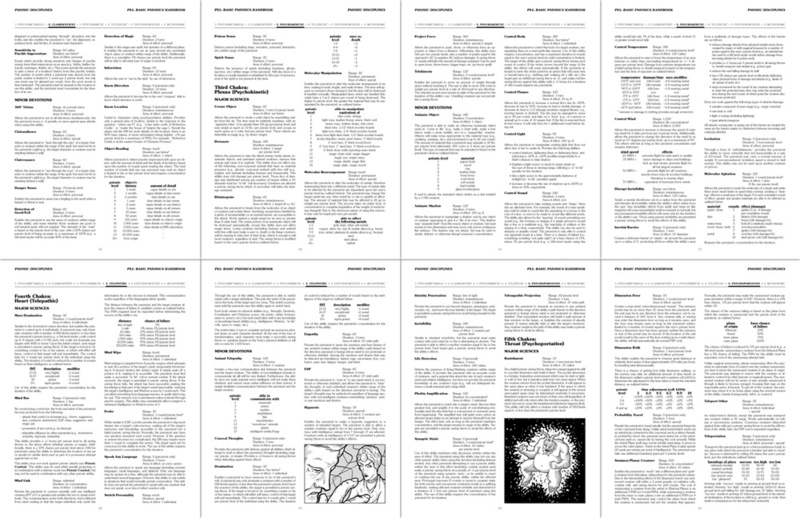 I figured that was close enough to being finished that I'd tease you all with a complete preview of the entire interior of the Basic Psionics Handbook. If all goes well, the PDF will be available starting Monday the 26th. Dallas, Texas — October 5, 2015: New Big Dragon Games Unlimited is proud to announce the upcoming release of its first fifth edition adventure module, Steve Marsh's Shattered Norns #1: Into the Shadows. 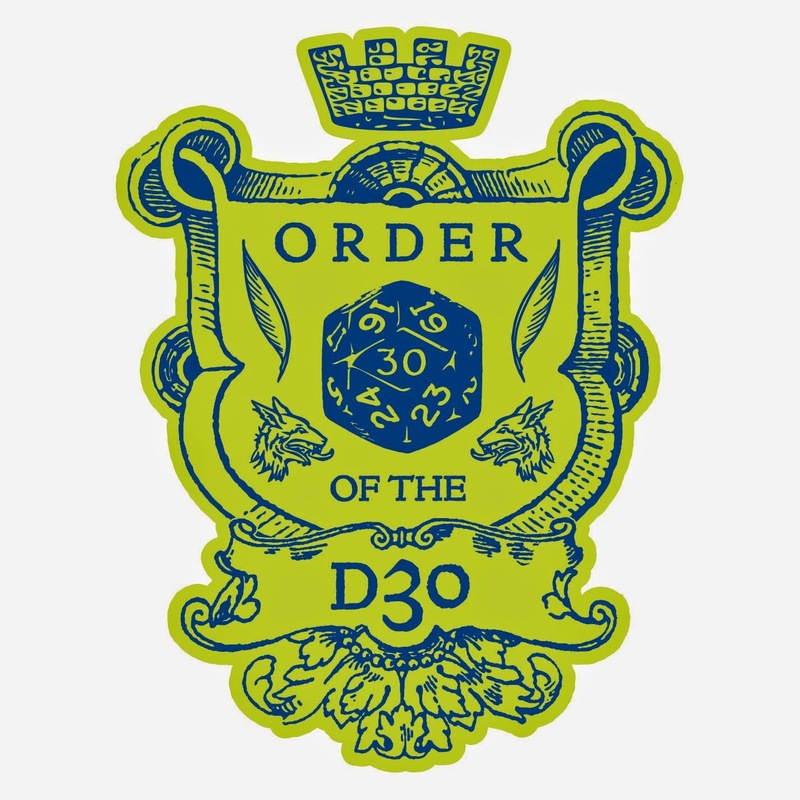 The book will be the first fifth edition product published by New Big Dragon, publisher of many popular OSR resources, including the d30 DM Companion and the d30 Sandbox Companion. 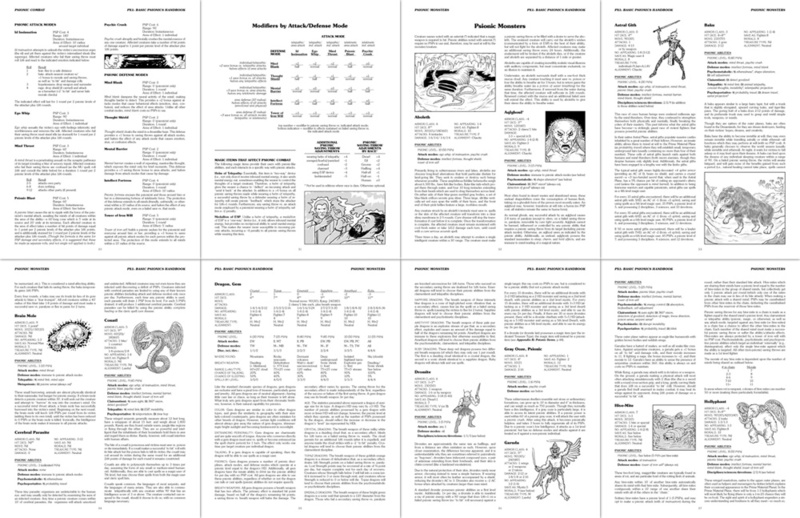 It is also the first formally published version of the Shattered Norns material, developed and written by RPG industry legend Stephen R. Marsh. Mr. Marsh is best-known for his contributions to the Expert rulebook for the classic edition of the world's original fantasy roleplaying game, as well as the concept of the game's dual-axis alignment system, and the introduction of the planes of existence to tabletop gaming. Shattered Norns, as a setting, deals with a world that was in the process of being created when it was torn apart by magic and treachery—a world still in formation when it was shattered by an incursion of chaos from outside the universe as it is commonly known, born by an intrusion of abominations. The intent of the Into the Shadows adventure is to introduce characters to one corner of the world and provide them with a base for additional adventure hooks and experiences. For players, it not only acts to introduce the Shattered Norns setting, but also introduces Mr. Marsh's vision of the Shadow Plane and guidelines for adventuring "in shadow." The world of Shattered Norns, and the Shadow Plane setting of the Into the Shadows adventure, sees the culmination of a great deal of Mr. Marsh's work. The setting has its roots in the 1970s, even predating the period he spent working directly for the company who published the world's original fantasy role-playing game. Star Strands, the original version of the setting, ended up in the infamous bonfire of 1985, when leadership of that company changed hands. In 1992, Mr. Marsh was reworking the material when tragedy befell his life, seeing him bury three children over the period of five years. Though the setting saw some ongoing development from the late 1990s and beyond, his daughter's participation in the “Next” playtesting beginning in 2012 provided Mr. Marsh the opportunity to fully resurrect his material. 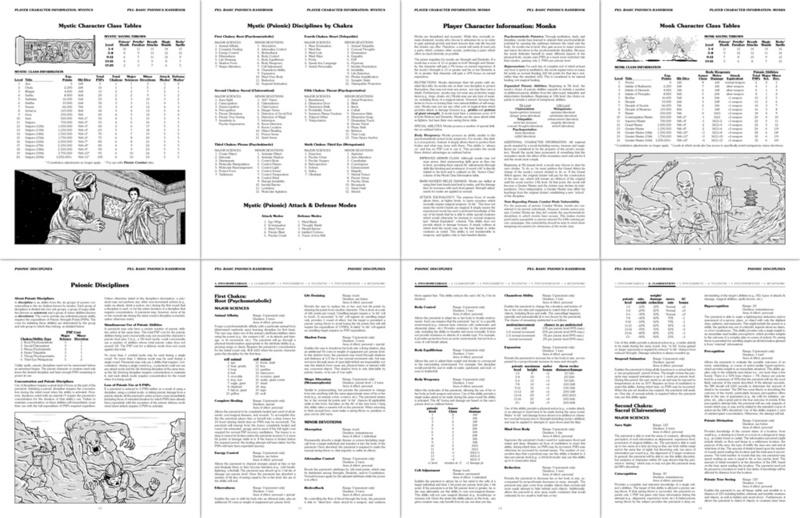 Over the last decade or so, much of the Shattered Norns setting material has been published to Mr. Marsh's personal web site, has been used at convention games refereed by Mr. Marsh, and has been issued in collector copies printed, bound and signed by the author. However, this will be the first time any of the material will be available in a formally published edition. 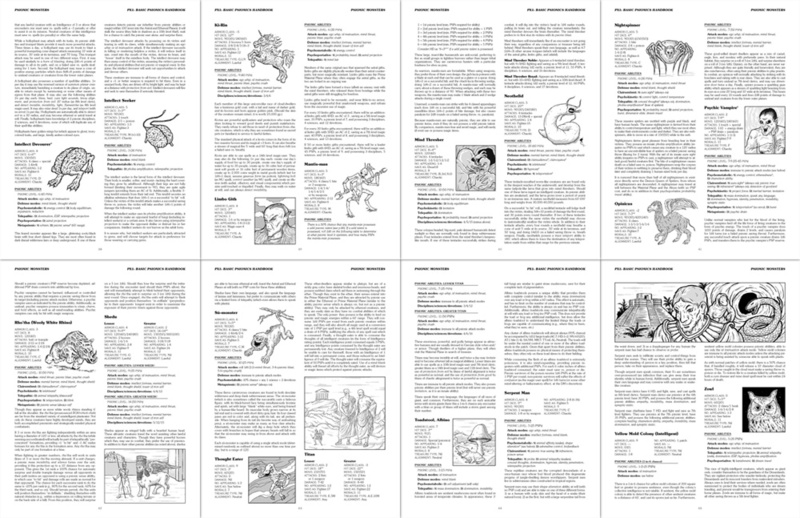 In addition to the material directly related to the adventure, the 48-page book will include listings for more than 20 new monsters penned by Mr. Marsh, as well as information on adventuring in the Plane of Shadow. Official release dates for electronic and print versions of the book have yet to be determined.